The Tale Of Despereaux - Movie Review - BluRay Details Included - Are You Screening? The Tale of Despereaux is the story of a mouse who, according to the tale, just isn’t. A mouse. He won’t hide. He doesn’t shrink away from the teensiest signs of danger. He thinks words like “adventure” sound pretty cool. He’s almost disgustingly non-mouselike. The story begins when a rat (and the rest of the crew of the ship that is his home) docks in a city famous for its soup. They’re conveniently there on Soup Day, its biggest holiday. Our rat, Roscuro, through the normal course of events, falls into the soup. This causes the Queen to, apparently, die of fright, or shock, or something. This causes the King to banish rats and soup from the land. Roscuro then finds himself thrown down to the furthest bowels beneath castle and city, where there exists an entire rat civilization. These rats live in a truly “animal” world, and Roscuro is stuck trying to exist with his seriously savage brethren. Meanwhile, a mouse named Despereaux is born. His mouse society is one in which learning to cower and scurry are the only important aspects of life. 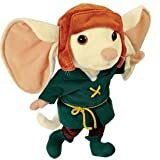 Despereaux, however, not only fails at meekness, he is decidedly bold and brave. He is eventually banished to the same rat cellar for his dangerous behavior, and for speaking to a human. From there, the story is a fascinatingly convulted web of characters and their trials. The King and Princess live in the depths of despair. Despereaux and Roscuro try to make sense of their lives after being told by the world that they are “wrong” by their very nature. The world’s greatest soup chef putters about in a castle and kingdom where soup has been outlawed. Through it all, our narrator (Sigourney Weaver) pulls us along, suggesting that events have more to do with internal struggles than with the bizzare happenings of fortune. It’s a strange mix of a story that’s almost too complicated to follow, and almost too random to bother trying. But, there’s just something about this strange… “soup” that manages to be wild in the right ways, and comfortable enough. Before you’re really sure what’s happening, or how you got there, you find yourself oddly interested in this menagerie and their individual brands of inner turmoil. The effort is aided brilliantly by beautiful imagery and an outstanding vocal cast, including: Matthew Broderick, Dustin Hoffman, Emma Watson, Kevin Kline, William H. Macy, Stanley Tucci, and more. It’s a tricky film to explain, and it’s just the sort of story that probably shouldn’t be taken apart too much. I could tell you all about the soup, and all the ingredients, but it might actually serve to alter your taste too much because of the expectations I might create. It’s so unique in its “comfort food/wildly exotic” mix, that going on too much about the fact that it has chicken is going to make anything too far from regular chicken soup taste off. It’s the kind of movie that forces you to just say that it’s surprisingly good, and offer a taste. And, like a lot of complex dishes, you might want to taste it again. The Tale of Despereaux was one of several movies that were overlooked in the later stages of 2008. None of them perhaps the next greatest thing ever, but movies like Igor, City of Ember, and others disappeared almost without mention. Despereaux didn’t completely crash, and it got some good reviews, but it didn’t manage to cover its budget in the U.S. theaters. It’s a movie that deserves to make up a bit on the exposure end of things now that it’s on DVD. Unlike many movies that don’t get great numbers at the box office, Despereaux has a very nice DVD release. The disc includes a very nice behind-the-scenes type feature, which explores the various worlds we find in the film, as well as the source material. It also includes a couple of games, and deleted songs. The Blu-Ray also has a very interesting feature which allows you to watch picture-in-picture of the sketchwork of the scenes and/or several clips of the actors recording the dialog. It’s really a nice package, and I would say a must own for anyone with children.